A long lasting performer that costs less then its natural counterpart. * A classic design that is hand-made and hand-shaped and manufactured to hold its point. * Constructed with traditional black albata handles for balance and seamless double crimped metal ferrules to ensure adhesion. * Innovative blend of techno-synthetic material with a large reservoir that mimics the performance of natural kolinsky. 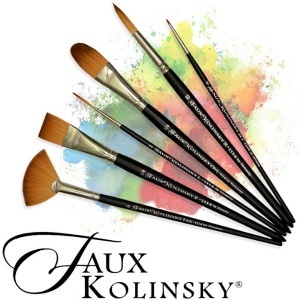 * These brushes have precision snap and responsiveness but are cruelty-free.